Charmante maison de 3 chambres à distance de la plage! Détendez-vous dans notre maison de charme sous les chênes et marchez ou conduisez 1/4 mile dans la rue à l'une des plus belles plages du monde! Doté de 3 chambres (1 grande pièce optionnelle V.), 1 salle de bain, douche extérieure fermée avec eau chaude et froide, cuisine entièrement équipée avec une barre de petit déjeuner pouvant accueillir 5, une table à manger pouvant accueillir 6, vous pouvez dormir confortablement 6 personnes. Profitez de 2 téléviseurs HD à écran plat avec câble et Wii avec jeux, Internet Wi-Fi, barbecue à gaz, laveuse et sécheuse, chaises longues et jouets et un guide de divertissement pour vous aider à vous déplacer en ville et profiter au maximum de votre séjour. Seule une courte distance de 20 minutes de Daytona Beach et 90mins à Disney World, Universal Studios et Sea World !! Sèche cheveux, First Aid Kit, et les produits de papier initial prévu. Christine and Tim have done a fantastic job keeping this beach house set up for a long stay! Comfortable beds, good towels, plenty of dishes and cooking equipment, good WiFi, big backyard, quiet neighborhood. And it's really clean! Small issue with the washing machine was handled very quickly. We are so glad we could accommodate y'all. You were great tenants as well. Thank you for our review and we are here for you when you need us! Thus is a must stay in property. Every detail has been thought of by the owners. Proximity to beach, city sights and restaurants is perfect. This house was awesome! It was really cozy and only like a 5 minute walk to the beach! Would definitely recommend this house to anyone looking to rent in NSB!! The house was very nice and comfortable, we really enjoyed our stay. The owners were awesome and very cooperative! I am looking forward to hopefully staying here again!!! We love to hear great reviews and that you had a great stay! We want to make sure you enjoy yourself with the almost comfort of home! We hope to hear from you again soon! Thank you so very much for such a nice review we greatly appreciate it! This was our 4th year in a row staying in this comfortable home. This is becoming our home away from home when my son and I take our "Guys week" to get away from the cold in Michigan. It has been a pleasure dealing with Christine, anytime we have to change our schedule or something comes up she has always taken care of our needs. The home itself is just great. You couldn't ask for more in a getaway for comfort and amenities. We have a great stay each time we come. Thank you Christine - for everything!! Wow! I'm so happy to hear your stay was great!! We love having y'all each year and we aim to please. Thank you so much for the fabulous review!! Had a great stay. Everything was as pictures in photos and all supplies were as promised. House was very clean. If I had one complaint it would be that the beds were not extremely comfortable but that's a matter of personal tastes. Overall I'd definitely stay there again. 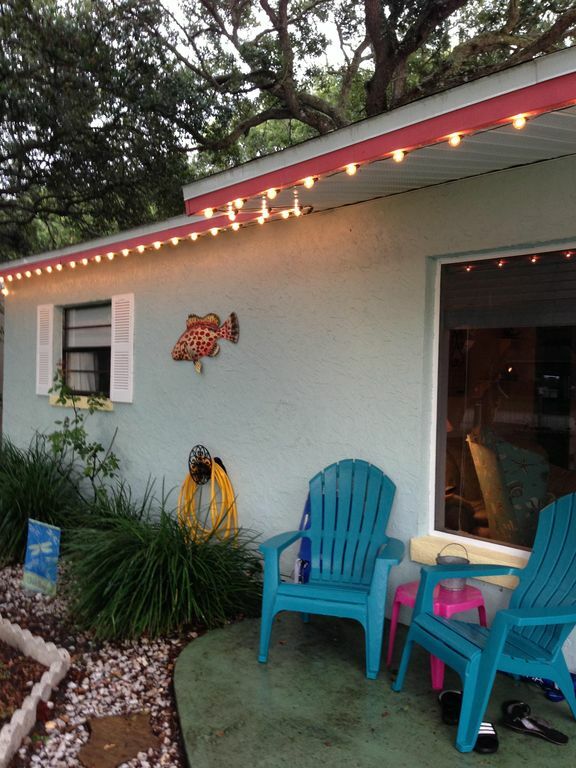 The house is a cute 3br located with in walking distance to the beach and even the bars and restaurants. We had a friend that had limited mobility so we took uber 3 times and it was less than $6.00 each way. Fully furnished is an understatement! This house had everything from chairs to crab traps to fishing poles. Publix grocery right around the corner and it was easy in and out for our Orlando flight. À quelques pas de la plage! Vous pouvez vous promener au shopping et profiter de la plage et à proximité des parcs pour les chiens et les enfants. Beaucoup de boutiques, restaurants, galeries d'art, location de vélos et de bateaux et bien plus encore. Autres Activités: Sur shore et off la pêche à pied, le vélo, la marche, la natation, le canoë-kayak, le canotage, le surf, le golf juste pour en nommer quelques activités à faire. Golf: Il ya au moins 3 golfs à proximité. Rates vary depending on the season so be sure to call us @ 407-227-6333 No smoking please. Small pets may be allowed, but needs to be shared with us so it can be added to the contract. We are able to accept PayPal, but the fees need to be covered by the renter. We prefer payment by check to save you money!